Standing on stage alone during the G.O.O.D. music banger "Clique" at the Hammersmith Apollo, West started out giving props to London's creativity and slamming "business people" who make him sick. "People get on the phone with me and [ask me] ... 'what kind of business are you doing?'" he said in a video of the incident on YouTube. "'What's the numbers? How much did you sell? What's the radio spins? How much shampoo can you sell with your face on it and s---?'" Soon enough, though, not impecunious rapper took it way further. "I got love for Hov, but I ain't f---in' with that 'Suit & Tie,'" he sang, dissing the comeback single from Justin Timberlake that features Yeezy's Throne mate Jay. 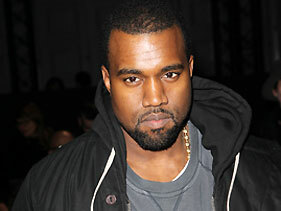 West also took another shot at Taylor Swift, who he famously interrupted at the 2009 MTV VMAs. "Taylor Swift beat Beyoncé at the Grammys? Beyoncé be dancing in heels and s---," he said, according to reports. The longest part of his rant didn't name names, but it made some very strong comments about stars who take big bucks from corporations for selling drinks. "Can I sell your drink for you please? So you can help me put on a better show," he said in a mocking tone just months after Jay's wife, Bey, announced a $50 million deal with Pepsi that will have the soda giant investing in some of her creative efforts. "Please corporations? Can you please support me, Please? Me, Kanye West? I swear I'm a nice n***a now. I swear I'll put the pink polo back on. I swear to you. Please? Just for three million dollars. I need it so bad. I need a new pool in my back yard. So I'll tell all my fans your s--- is cool. And if they believe in me they should also believe in you . . . Did we you the check yet? Did the corporation send the check yet? What's my public rating right now? Are people liking me again? Enough to get some money from the corporations? Are they liking me now? They forgot about the whole Beyonce thing right? Okay cool. Is it okay now?"